Really. Is It THAT Hard To Put It Between The Lines? A little thing I wrote for Car Buying went nuts today (even though it went up yesterday) and just crossed the 110K read mark. Not that I watch that counter obsessively or anything. I have much more important things to do. Like wonder why my neighbor cannot park his car between those handy lines someone painted in our parking lot. Yes, the green Explorer on the right is mine. Someday I will write the definitive piece about that truck (241,000 miles today - every single one by me) so don't rag on me too much about driving a car older than Twitter. 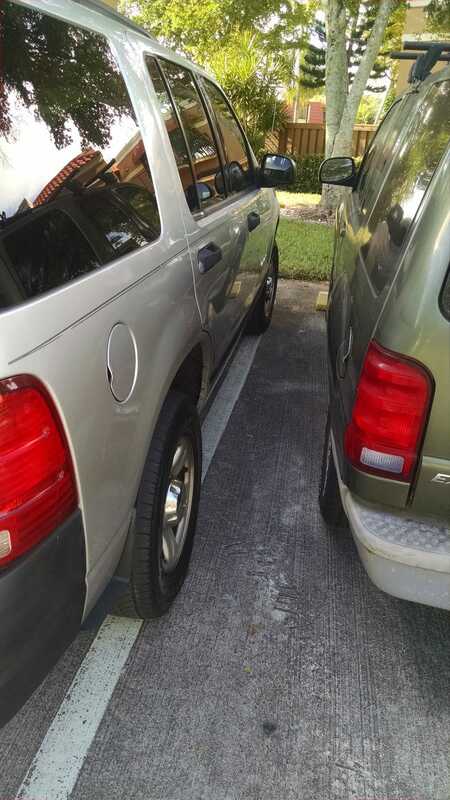 This is the same neighbor who spent the better part of the last year hammering the doors on his truck into mine. Apparently, he has decided he was doing it from too far away. So, he moved closer. The good news? I saw some notices taped to his door the other day. One was a 3-Day Notice to Quit. So long as my truck survives until the weekend, I think she'll make it.